10th pass and 12th pass bharti in Ministry of Defence, Heavy Vehicle Factory. 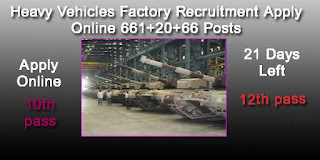 Ministry of Defence invites application Apply online for various posts in Heavy Vehical Factory Avadi, Chennai. Group C posts. Industrial cadres and non-Industrial Cadres. Age limit :- Candidates who want to apply Heavy Vehicle Factory Job must aged between 18 to 32 years for Industrial Cadres and 18 to 27 years for Non-Industrial cadre. Industrial cadre : Candidates must have Matriculation with NAC/NTC issued by NCVT in relevant trade . 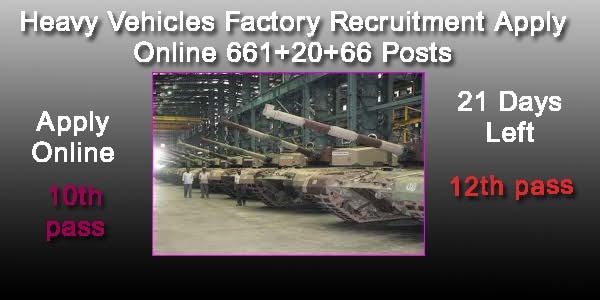 How To apply Heavy Vehicle Factory job online? Visit official website www.hvf.eadmissions.net and read the application carefully before submitting application online.